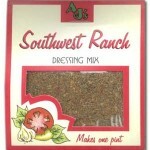 Creamy ranch dressing with a southwest flair. 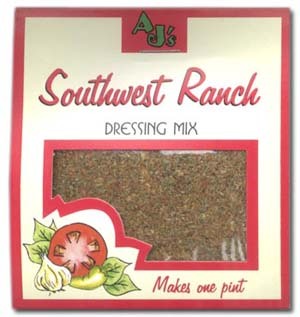 Mix with 1 cup mayo & 1 cup sour cream or favorite substitute. Ingredients: Dehydrated onion, parsley, chili powder, paprika, garlic, celery salt, cumin cayenne, cilantro, sea salt spices and pepper.